The Long-tailed Widowbird was formally named by Pieter Boddaert, a Dutch naturalist, in 1783. Boddaert published fifty copies of an identification table of Edme-Louis Daubenton's Planches enluminees, assigning Linnean binomial names (scientific names) to the coloured plates. Many of these names were the first scientific names to be proposed, and so they remain in use today. 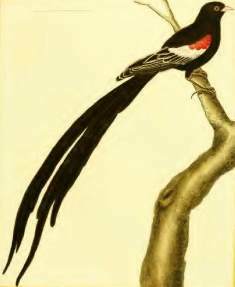 Georges-Louis Leclerc, Count of Buffon, was the first to describe the Long-tailed Widowbird, but he did not accept the binomial system of Linnaeus and so he is not credited as the formal author of this species. Buffon described many birds and other animals in a series of volumes (see here). The 9 bird volumes were published between 1770-1783 and Buffon commissoned Edme-Louis Daubenton, to supervise a book of illustrations - the coloured engravings by Francois-Nicolas Martinet were published in 1783 as Planches enluminees. In Buffon's description of the Long-tailed Widowbird in 1778, he provided the French name La Veuve a epaulettes (The Widow with shoulder patches). Buffon noted that the bird originated from Cap de Bonne Esperance, the Cape of Good Hope. Buffon also gave the plate number of Martinet's colour engraving, although this was only published 5 years later. Buffon listed the Long-tailed Widowbird as coming from the Cape of Good Hope, which could mean the Cape in its broadest sense, ie either the Western or Eastern Cape. Clancey eventually restricted the locality to the Eastern Cape, as the Long-tailed Widowbird does not occur in the Western Cape. Buffon had many correspondents who sent him specimens from different places in the world, but no details are published for the Long-tailed Widowbird as to who collected this species. Emberiza progne	Boddaert 1783	Tabl. Planch. Enlum., p39	Cape of Good Hope, S Africa (ex Daubenton, Planch. Enlum., pl 653). Restricetd to E Cape by Clancey 1966.
progne (Latin) = a swallow, from Greek mythology = 'Prokne', a daughter of Pandion, who was transformed into a swallow. 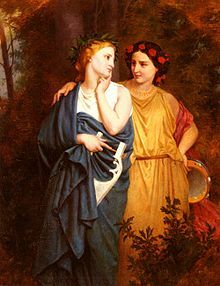 Read the myth in wikipedia. Presumably Boddaert heard about the display of the Long-tailed Widowbird and likened it to the fluttering flight of a swallow. Before 1778, when Buffon wrote about this species. No type specimens known to survive, but the painting of Daubenton serves as a type. Identification. The Long-tailed Widowbird Euplectes progne is one of the most conspicuous grassland species where it occurs. The male in breeding plumage is unmistakable, with a tail up to 50 cm long (60 cm in Kenya). The bill is heavy and white (small and black in the Red-collared Widowbird, the shoulders are red and white (tawny brown in Jackson's Widowbird. 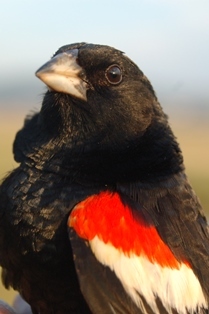 Non-breeding males are by far the largest of the streaked widowbird species, with a floppy flight and broad rounded black wings, still showing the red and buff epaulets; the tail length is variable, and the feathers pointed (rounded in Fan-tailed Widowbird Euplectes axillaris. The female Long-tailed Widowbird is much smaller than the male. The female has narrower streaking on the back than the Fan-tailed Widowbird, and is best separated from Jackson's and Hartlaub's Marsh E. hartlaubi Widowbirds by the uniformly dark underwing-coverts. 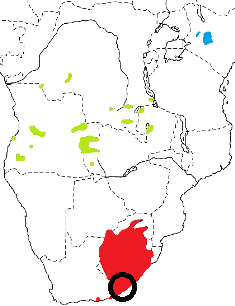 E. p. progne in Botswana, South Africa, Swaziland and Lesotho (see red on map). E. p. delamerei, in the highlands of Kenya (see blue on map). The male of this subspecies is longer-tailed. 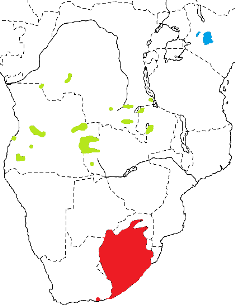 E. p. delacouri, in DRCongo, Angola and Zambia (see green on map). The male of this subspecies has the upper mandible black rather than bluish, there is no white on the epaulet and the buff area is broader, and the wing longer. Populations in Kenya are threatened by agricultural development of grassland areas within their limited range. Habitat. The Long-tailed Widowbird inhabits grasslands, often where grass is short, and not necessarily in marshy areas. It also occurs locally on coastal grasslands. It roosts communally in marshes even when breeding or in clumps of dense, high grass which may hold hundreds of birds of several species. Males flying to their roost site in the late afternoon fly high and fast; and claims that a male with a long tail is unable to fly in heavy rain or wind appear to be unfounded. Food. The diet of the Long-tailed Widowbird is mainly grass seeds. In the Free State, South Africa, the greatest variety of seed types are eaten in spring and winter. Nestlings are fed mainly with grass seeds, with arthropods about 25% by volume, including larvae, cicadas, aphids, beetles and spiders. The Long-tailed Widowbird forages mostly on the ground, where it both walks and runs, but hops on uneven surfaces. It also hawks insects in flight. Males may leave their territory to feed. Breeding. The Long-tailed Widowbird is polygynous, and a male may have up to 5 females. Males are territorial, having favourite perches on fence posts, termite mounds or small trees. The male advertises his presence with a 'tsik' call from his perch, to which males on adjoining territories reply. Males pursue intruders in direct flight, with the tail streaming straight out behind. When a female enters his territory, he gives a highly characteristic flight display with a 'keeled' tail and laboured wingbeats, and epaulets conspicuous. Experimental manipulation of the tail length of a male suggests that females visit several territories in succession, and preferentially select the longest-tailed males. The nest is woven of fine grass including growing green material. The nest is lined with flowering grass heads, which may project to form a short porch over the side entrance. The nest is sited close to the ground in a tuft of grass, with blades of grass bent over above the nest to form a bower, and concealing the nest. The male may make a simple nest ring, but it is the female that builds the nest for breeding, within a male's territory. The female continues to add lining during incubation, until the nest is densely padded. Nests are destroyed by people, raptors, rodents, driver ants and flooding. 2-3 eggs are laid, which are greenish white or blue-green, and heavily speckled with grey and olive-brown. The female incubates the eggs and feeds the young.